Our lives are unscripted. I had to make some sympathy cards this evening. This is the one card I do not enjoy making. The reality is we lose people we love. I always hope a handmade card will bring the recipient comfort. 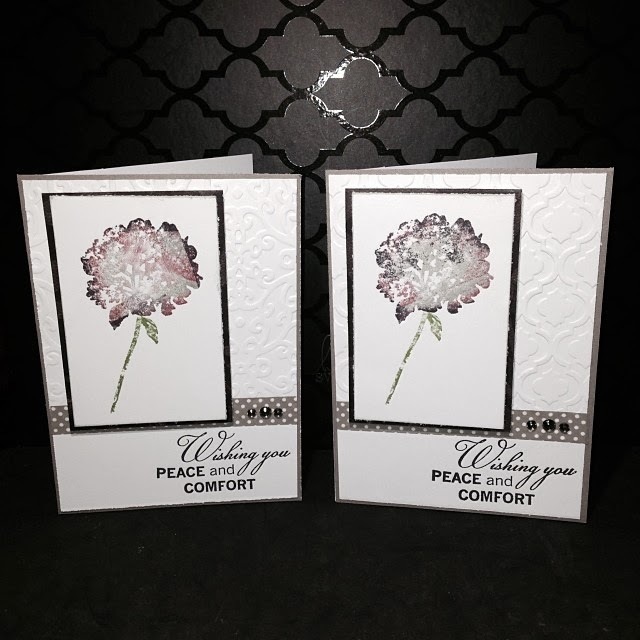 The card design is the same for both cards with the difference in the embossing folders. The folders used are Trellis and Berry Swirls made by Sizzix. A peek inside the box---> Coming soon are embossing folders you can purchase through CTMH in our Feb Idea Book..I can't wait!!! I used For Always paper packet and White Daisy card stock. The flower is from the Unscripted stamp set. I rolled the stamp in Whisper, Vineyard Berry(retired) and Black ink. The stem of the flower is stamped in Topiary ink. The sentiment is from the Words of Comfort stamp set. I embossed 3/4's of both of the White Daisy mats. I finished off the bottom of the embossing with a strip of the Slate Polka Dot washi tape and added bling from the Sparkles Black and Grey assortment.